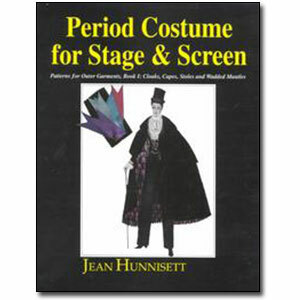 Renowned costumier and author, Jean Hunnisett, did a tremendous amount of research and was acclaimed for the authenticity of her costumes. As well as being accurate, her patterns have been prepared so that they can be readily made up using today's fabrics and sewing methods, and fit the modern female figure. This is the first book in this series concentrating on outer garments — Cloaks, Capes, Stoles and Wadded Mantles. It is abundantly illustrated by drawings and photographs and includes scaled patterns for outer garments from Travelling Cloaks to elegant Shoulder Capes. The second book on outer garments concentrates on — Dominos, Hoods, and Coats.